Drew Weing and Eleanor Davis’ Flop to the Top, reviewed. A lovely story of viral fame for very young readers. A panel from Flop to the Top! As Gabriel Roth writes in this week’s Slate Book Review, whomever else comics are for, comics are for kids. 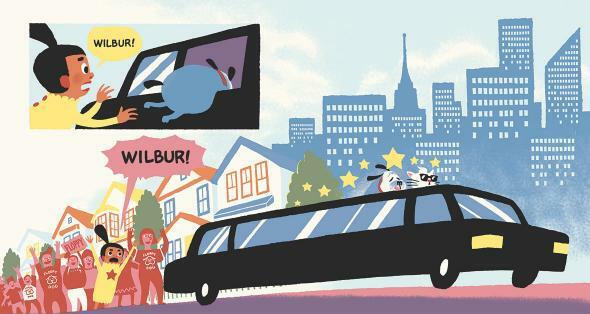 Comics encourage early and reluctant readers to crack a book, and comics deliver funny, smart, and exciting stories to children at all reading levels. That’s the mission of Toon Books, the publishing imprint founded by Françoise Mouly, and the company publishes some of the most charming comics around for young readers. It also gives some of America’s best young cartoonists the chance to draw and write for a new audience. I’ve been a fan of Drew Weing since I read his wordless, magical shanty of a book, Set to Sea, five years ago. The Georgia-based cartoonist, who also created the great all-ages Web comic The Creepy Casefiles of Margo Maloo, is back on bookstore shelves this month with a Toon book that’s great for first- and second-graders: Flop to the Top!, a silly and amiable fable of viral fame. Little Wanda wears sunglasses, takes selfies, and definitely believes herself to be a star. But when her floppy dog Wilbur gets 20 million likes for his online photo, Wanda must watch him live the life she’s always dreamed of. Weing wrote and illustrated Flop to the Top! with his wife, the Eleanor Davis—also a Slate Book Review illustrator—and their beautiful digitally painted work will charm parents just as the story enchants kids. It’s a wonderful example of comics in action—grown-up artistry matched with childish silliness. I’m very pleased to have Drew Weing illustrating the September issue of the Slate Book Review. Flop to the Top! by Drew Weing and Eleanor Davis. Toon Books.